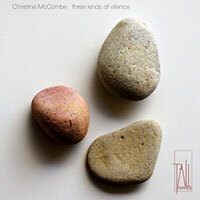 Christine McCombe writes about her exploration of silence in a series of chamber works, all just released on a Tall Poppies album three kinds of silence. Read also: more 'Insight' articles by the AMC's Represented and Associate artists. As a composition student many years ago, I can remember feeling compelled to cover the manuscript paper with notes. Composing a three-minute piece meant filling three minutes of silence with sound, as though gaps in the musical fabric where a deficiency, a sign that you were lacking in ideas or that you didn't have enough to say. Nowadays, when I am working with composition students and I see a similar compulsion to fill the page with notes (made so much easier thanks to the cut-and-paste functions of music notation software), I smile to myself, and then launch into my favourite subject: 'Let's talk about silence'. As a composer it is always interesting to revisit older works - something I feel is a bit like time travelling. I can hear what was going on in my head twenty years ago, what my preoccupations were, recalling the emotional starting points for a particular piece. Time and distance also bring perspective, and, from where I sit now, I can hear that the things I hold as most important in my music today were there, quietly evolving, in works that I wrote much earlier in my composing life. The process of revising, rehearsing and recording a new CD of my chamber music (three kinds of silence on Tall Poppies) gave me the opportunity to delve back into my compositional past and find the connecting strands between works that, on the surface, might seem quite unrelated. More than anything, music for me is about time and space. This was true in earlier works such as Love into Stone (1997) and is still very much the case in a more recent work like to the wider ocean (2015). I believe one of the most powerful ways to evoke time and space is through silence - something that I chose to explore in two works that foreground the temporal and spatial aspects of silence: the art of placing stones (2010) and three kinds of silence (2013). Love into Stone was written shortly after I moved to Glasgow (UK) to study composition with James MacMillan. It was commissioned by the Royal Scottish Academy of Music and Drama for its then principal, Sir Philip Ledger, and the Alberni String Quartet. I remember this time in my life as quite solitary and dislocated, missing Melbourne and my circle of friends, and spending time going on long meandering walks around the east end of Glasgow, including the extraordinary Necropolis. This space and time is held in the work that emerged, the title referring to the headstones and mausoleums that memorialise the passing of loved ones. The descriptive, atmospheric and programmatic aspects of the piece clearly reference a particular way of imagining time and space but the more purely musical parameters of the work also explore time and space in different ways. While studying at the RSAMD I took an elective in Music Analysis taught by British composer Stephen Davismoon, who introduced me to the work of Jonathan Kramer, specifically his book The Time of Music (Schirmer Books 1988). Kramer's way of describing the temporal aspects of music, the experience of time in music, stirred my imagination and has had a lasting impact on how I think about the passing of time through music. Love into Stone explores different qualities of temporality: musical time is at one point static, at another filled with cascading momentum. American philosopher Susanne Langer suggests that part of the expressive power of music is its ability to create powerful experiential illusions: 'experiential time is the primary illusion of music. All music creates an order of virtual time'1. Langer suggests that a sense of virtual space is a secondary illusion, created through movement and musical depth2. Concepts of density, register and relative dynamics enable us to perceive spatial relationship and movement in music, creating the powerful (if illusory) experience of space as well as time. This 'virtual' musical space is apparent in Love into Stone, evoked through sparse textures, dense registral bands or expanding pitch fields, gradually transforming through musical time. A sense of space and time is already implied in the title of to the wider ocean, my composition for voice and piano trio, based on four poems by Australian writer Alison Croggon. The poems are sensuous and evocative, referencing the cycles of life and recurring imagery relating to the sea. One of the joys of working with texts is the possibility for rich layering of imagery and association through the interaction of words and music. While the text unfolds through the voice, the instrumental textures can offer an alternate reality, sometimes supporting, sometimes co-existing, or even working against the melodic and textual unfolding of the voice. Strangeness, ambiguity, disconnectedness and the unexpected are more interesting to me than a simple hierarchy of voice and accompaniment. The second and fourth sections of the work illustrate how the 'illusions' of time, space and time are explored. In 'Lamps' (second section), wide registral spacing between the voice and instruments evokes a spaciousness, while the slow tempo and simple textures create a stillness and sense of time slowed down. In the final bars of 'Lamps' there is a seven-octave distance between the lowest and highest pitches, with very little in between, drawing the ear's attention to the huge sonic space between the sounds. In the fourth section, 'to the wider ocean', the registral space is initially contained within a very narrow band, starting with a major second and then incrementally opening out to an octave. Limiting sounds to a contained musical space creates a sense of focus and immediacy, which gives added impact to the point in the music where the textures open out. This approach to the musical space evokes, for me at least, a sense of possibility, of 'wider oceans' of sound yet to be explored, the musical shapes and textures functioning as a symbol for something else. As Susanne Langer wrote: 'music is a "significant form," its significance is that of a symbol, a highly articulated sensuous object, which by virtue of its dynamic structure can express the forms of vital experience which language is peculiarly unfit to convey'3. The instrumental textures in to the wider ocean are thus able to create an experience of 'opening out', in time and musical space that words can only hint at. The 'illusion' is a powerful one. Reading Susanne Langer, dipping into phenomenology and semiotics, and discussion of musical time led me to the work of Thomas Clifton and in particular his article 'The Poetics of Musical Silence'. The opening lines had me hooked: 'To focus on the phenomenon of musical silence is analogous to deliberately studying the spaces between trees in a forest: somewhat perverse at first, until one realizes that these spaces contribute to the perceived character of the forest itself, and enable us to speak coherently of "dense" growth or "sparse" vegetation. '4 This statement resonated with me because I had earlier been introduced to the Japanese concept of 'Ma' by a colleague and was immediately taken with the idea. 'Ma' refers to the spaces between things - either sounds, or objects, or events, - in Japanese music, theatre and design. These intervals or 'spaces between' are loaded with significance - they are not blank space but actively frame and give context to the events that surround them. Clifton's thoughts on musical silence reflect the concept of 'Ma'. '…silence is not nothing. It is not the null set. Silence is experienced both as meaningful and as adhering to the sounding portion of the musical object. Silence is experienced as embodied substance or activity. This suggests that silence participates in the presentation of musical time, space, and gesture'5. Reading these words now, I still feel that excitement of a 'light bulb moment' and the sensation of different strands of my creative practice coming together and things falling into place. Music as significant form, as experience, as something that expresses things that cannot be said in words, creating illusory worlds, distilling space and time into sound and silence. Although silence has always been present in my work in various ways, the first composition to deliberately set out to explore silence as a structural element is The Art of Placing Stones (2010) for violin and piano. The work is an exploration of the concept of 'Ma' and the title refers to Japanese garden design where great attention is paid to the placement of stones and other features and the spaces between these objects. The Art of Placing Stones consists of nine short sections with measured silence at the end of each section, specifying the 'dimensions' of the silence before the next section begins. The Art of Placing Stones is very minimal, pared back, each section aiming to capture an essence or quality, with minimal development of material within sections, although motivic elements recur. I have been drawn to working in miniature or small sectional forms before. An earlier work, Songs of Truth and Loneliness (1995 - see MP3 and the Giants in the Land album by Move) covers similar territory, but from a different perspective, exploring contrasting states in a series of eight short pieces, placed in a very deliberate way. The compositional decision to write a series of miniatures that form a coherent whole appeals to me on an aesthetic level, but at the time of composing The Art of Placing Stones this approach had a more practical side. My two children were very young, my time was very fragmented, as was my attention span, due to lack of sleep, so writing a series of short self-contained pieces offered a way back into composition that was achievable and realistic. I remember writing about this time in my composition life (see this article on Resonate) and this work really did feel like a re-emergence. Looking at the work now I can appreciate how finely wrought each section is and how the constraints on my time and energy actually focussed my composition intentions, distilling musical 'moments' and luxuriating in the silences between at a time in my life when silence was hard to come by. As a composer (although not as a mother) I am allowed to admit that I have favourites - and the third movement of Three Kinds of Silence is one of my favourite compositions. The title of the work as a whole refers to the article by Thomas Clifton mentioned earlier. In 'The Poetics of Musical Silence' Clifton suggests different categories of musical silence: 'Temporal Silence', 'Silence in Registral Space' and 'Silences in Motion'. It is these three types of silence that I chose to explore in my composition. The three movements are titled, in order, 'Time, interrupted', 'felt but not heard' and the third, 'possibility and ending'. The first movement explores the discontinuity of hard-edged silence that cuts through the musical continuum. The second plays with the idea of music dipping below the threshold of hearing - it is still present somewhere, you just can't hear it. The third movement moves beyond a curiosity about the structural and dramatic potential of silence in music and explores the nature of ending, both musical and otherwise. In his discussion of 'Silences in Registral Space' Clifton reflects on the nature of absence and presence in music. Registral silence can be heard as tension, a possibility; an invitation for sound to move into that space. Silence can be used structurally to emphasise connections across the span of a piece; or silence, the absence of sound, can be experienced as a 'loss'. Clifton's exploration of this final kind of silence is particularly poignant as he discusses how silence can function as a process of 'disengaging' where the music itself becomes absent. Referring to the work of the phenomenologist Martin Heidegger, Clifton draws connections between musical silence and a phenomenology of ending, suggesting that music can, through the unfolding of silence, represent the essence of dying. 'If I were the piece of music, I would experience my end when I become finally and irrevocably disengaged from relations which I have formed with my past and any possible future'6. The third movement of Three Kinds of Silence is my poetic and musical exploration of this idea - that silence can offer a possibility but also a disengagement with possibility, and through the emptying of the musical space, a preparation for ending. The work is also my own way of expressing my grief at the death of my mother, in 2011, and an attempt to articulate, through music, my sense of loss, of her absence in my life. In this way, a 'fear of silence' is transformed into an acceptance of silence, and this in itself offers a kind of possibility, a different way of being with silence and absence. 1. Langer, Susanne (1967) Feeling and Form, Routledge, p. 109. 4. Clifton, Thomas (1976) 'The Poetics of Musical Silence', Musical Quarterly, Volume 62, No. 2, April 1976, p. 163.